Two of my courses on lynda.com were updated recently, and next week, with a free LinkedIn account, you'll be able to watch them, and the rest of the lynda.com training library, for free! 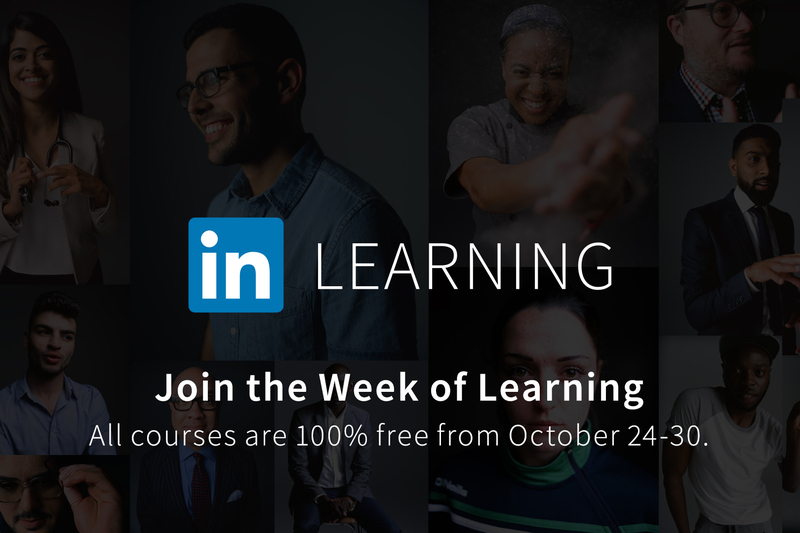 They're running the Week of Learning promotion next week, from October 24 - 30, to promote LinkedIn Learning, which is the entire lynda.com catalog geared toward the LinkedIn audience. This was a very busy weekend. I spoke at WordCamp Orange County on how to use a debugger, and it went well. If you were there, or if you're just interested, you can view the slides here, and fork them on GitHub. This Wednesday, June 11, I'll be speaking at the downtown meetup of jQuery LA. I'll be showing a relatively simple jQuery filter that does something useful with images, and show how it can be converted into a plugin without a whole lot of hassle. Then you can take that plugin and reuse it on other projects more easily, and even distribute it through the jQuery plugins registry, your GitHub account, or wherever you like.